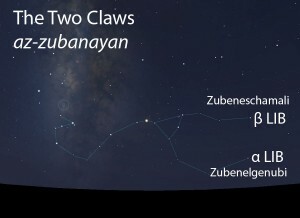 The Two Claws (az-zubanayan) are part of the Arabian constellation of the Scorpion (al-‘aqrab). The Arabian Scorpion followed the image of the scorpion defined by the Sumerians more than 3000 years ago. 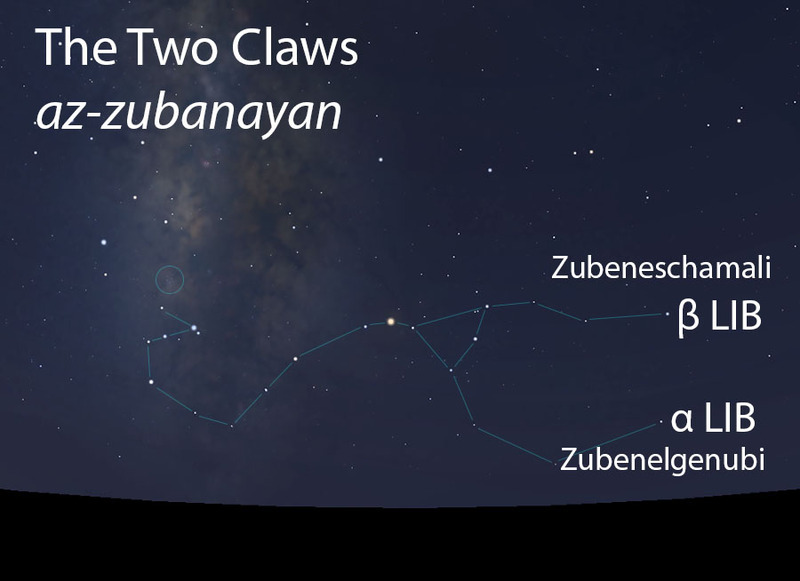 The Two Claws were often recalled in the singular, the Claw (az-zubana), within the context of the lunar stations. The two stars that were called the Two Claws marked the tips of each Claw. The Two Claws (az-zubanayan) of the Scorpion (al-‘aqrab) as they appear in the west about 45 minutes before sunrise in mid-May. Sky simulations made with Stellarium. A pair of moderately bright stars that follow after the Two Sky-Raisers (as-simakan). The Two Claws of the Scorpion do not figure in the calendar of the rains stars. In early listings of the lunar stations, the Claw (az-zubana, the singular form) is the 18th station of the year. This was later changed to the 16th lunar station after the stations were adjusted to begin with the vernal equinox. The stars of the Two Claws match part of the Hindu nakshatra called Visakha. The Two Claws are part of the Scorpion (al-‘aqrab, العقرب) folkloric celestial complex, which extends from these Two Claws (az-zubanayan, الزبانيان) to the Raised Tail (ash-shawla, الشولة).